All too often, tradespeople can be on the back foot when it comes to collecting payment, as was the case with City Boiler Repair and Eastway Electrical Contractors. That all changed for them when Square came along. Cancellations are a recurring nightmare for home repair businesses across the UK. Timewasters can cost you dearly. Trade professionals know the drill inside out: an appointment is booked, you block out the calendar, load up the van and plan your route, only for the job to be called off at the last minute. The stress they cause is commonplace in the working week of many, but hope is on the horizon as business owners fight back. After realising just how much their payment systems had to answer for, Omari went in search of a new solution. The company’s reliance on cash and Bacs transfers for payment turned out to be one of the biggest sources of instability – not only creating a loophole for clients to book appointments noncommittally, it was slowing and hindering cash flow. After exploring the options, Omari finally came across payment technology company, Square. The benefits were felt from the get-go: “A big problem we faced was the number of customer cancellations. We were losing money and wasting time – we needed a solution. There are lots of payment solutions on the market, which can be confusing. Most of them require lengthy contract terms or minimum transaction amounts, as well as high fees. As a small business, it just wasn’t feasible for us to commit to something like that. Around the time we were looking, we came across Square. There are no contracts, no commitments and they have very competitive rates. It really has transformed our business. Armed with the latest payment technology, the business now operates with no fears about getting paid, and paid fast. The true cost of not taking card payments is coming to light for an increasing number of companies like Eastway Electrical and City Boiler Repair. With debit card payments now overtaking their cash equivalent, as evidenced by recent reports, providing choice for customers is just as important as your own security. When you have a remote, on the move business where the customer doesn’t visit you in person, taking over the phone payments saves time. With a tool like Square Virtual Terminal, it’s as simple as calling your client and keying in their card details. You can use it on the go on your smartphone or iPad, or back at the office on your desktop computer or laptop. Whilst enabling you to get paid anywhere, at any time, accepting card payments also gives you the authority to secure pre-appointment deposits over the phone. If, like most, you’re looking to cut down the annoyance they cause, this is a far more amicable route than enforcing cancellation fees. 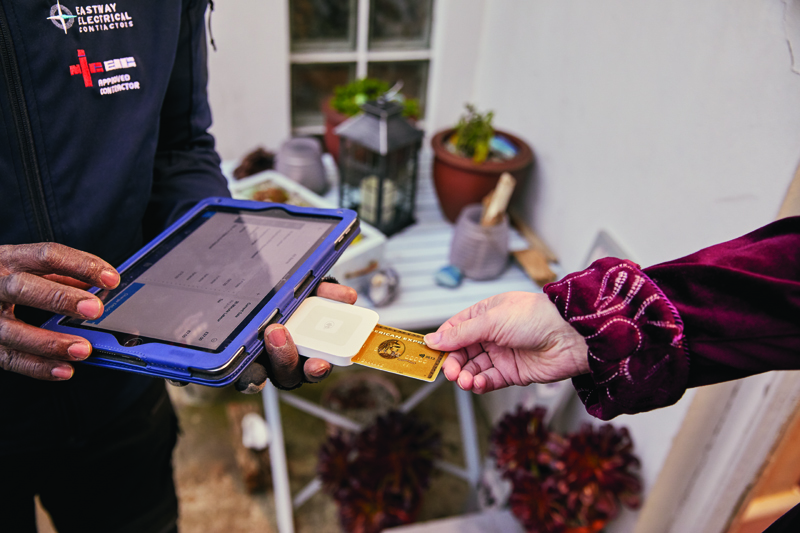 With fewer people keeping cash on them or in their home, having a compact, portable reader opens up an incredible opportunity to take payments their way. With a device like Square Reader that accepts contactless, chip + PIN and mobile payments, there’s never an excuse for delays. Security is at the heart of all home repair businesses. You go to great lengths to safeguard the equipment and transport that fuels your livelihood, so with more card payments and less cash on your person, your earnings can be given the same protection. For more information, visit www.squareup.com/gb.